Apple today released an updated version of iOS 9.2.1, which is designed to prevent the "error 53" device-bricking message that some iOS users received after having their iPhones or iPads repaired by third-party services using components not sourced from the original device. Non-matching repair components that affected the Touch ID fingerprint sensor caused an iOS device to fail a Touch ID validation check because the mismatched parts were unable to properly sync. The validation check occurred during an iOS update or restore, and when failed, Apple disabled the iPhone, effectively "bricking" it in an effort to protect Touch ID and the related Secure Enclave that stores customer fingerprint information. Today's update will restore iPhones and iPads that have been disabled due to "error 53" to full working condition and it will ensure that future iOS devices that have had similar repairs will not be fully disabled. 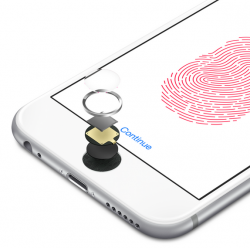 Touch ID will not, however, be accessible until Apple-authorized repairs are made to a device affected by the issue. Alongside the new version of iOS 9.2.1, Apple has also published a support document outlining how customers can resolve the "error 53" problem, and it has issued an apology, shared by TechCrunch. Apple now says the error 53 bricking issue was meant to be a factory test and was never intended to affect customers. "Some customers' devices are showing 'Connect to iTunes' after attempting an iOS update or a restore from iTunes on a Mac or PC. This reports as an Error 53 in iTunes and appears when a device fails a security test. This test was designed to check whether Touch ID works properly before the device leaves the factory. The updated version of iOS 9.2.1 is available through iTunes and is not designed for customers who update their devices over the air. It can be downloaded on the iPhone 6, 6s, 6 Plus, 6s Plus, iPad mini 3, iPad mini 4, iPad Air 2, and iPad Pro. How would you do an over the air update on a bricked phone? I just wanna know where all the, ‘No it’s your own fault' posters are. This is exactly what should have been done in the first place. Disable TouchID and leave the rest of the phone alone. Wow. SO everyone proclaiming that this was a necessary safety implentation and that Apple shouldn't budge were utterly and completely wrong and this was either NOT working as intended or the public pressure put on Apple caused them to backpedal (I am guessing the former). The reason behind Error 53 has apparently changed since this was first reported. This current one sounds a lot better. hah! Our long (three week) national nightmare is finally over. The few dozen people reported to have bricked phones can finally use them again. Yay freedom! At least we can now focus on less important matters like the future of the country. This is so un-Appley. But I like it. If you believe that you paid for an out-of-warranty device replacement based on an error 53 issue, contact Apple Support ('https://www.apple.com/support/contact/') to ask about reimbursement. But all the security experts on MacRumors said this was impossible! Don’t worry. They’ve all returned to the original thread and retracted their statements or apologised.